This is the second installment of a three-part essay. Playing the violin, however, was only a small part of her overall workload. It has to be remembered that in those days, there were no travel agents making arrangements for musicians. Virtuosos themselves often communicated directly with orchestras to arrange their programs. And not only did they have to determine their own programs, they also had to know who was playing what concerto in various cities across Europe, so that they would not play a piece that had just been performed. There is a fascinating letter in the UK National Archives written to a concert manager in Holland in which Wilma suggests a program for her upcoming tour there. She gave the manager two programs to choose from: first, the twenty-second concerto of Viotti or the eighth concerto of Spohr, paired with the second two movements of the first Vieuxtemps concerto; or second, the slow movement from Spohr’s ninth concerto or Beethoven’s Romance in F, paired with the Mendelssohn concerto - that is, unless Joachim has recently played the Mendelssohn in Amsterdam, as she knew he had recently visited there. It must have taken extraordinary energy to keep up that kind of correspondence with the concert managers of Europe, as well as keep in shape technically, all while raising her children. During this busy time she often collaborated with her multiple musical siblings. In one concert program in London in 1875 she played first violin in a trio by Bargiel; two pieces by Schumann rearranged for two violins and cello (with Wilma and her sister Maria, now married and known as “Madame Arlberg-Neruda” on violin, and her brother Franz on cello); and finally, to wrap things up, the Schumann E-flat quintet, with Charles Halle on the piano and Franz on cello. Hush! 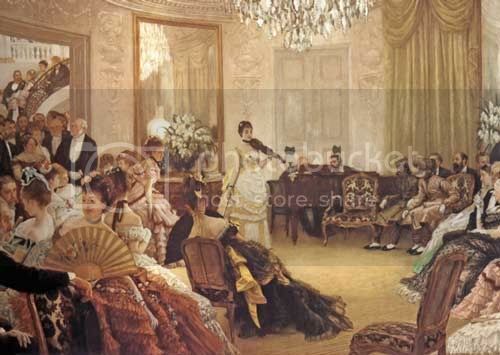 The Concert, by James Tissot, 1875. The woman in the picture is widely accepted to be Wilma Norman-Neruda. Wilma grew so beloved in Britain that, in 1887, when Arthur Conan Doyle was writing his first Sherlock Holmes story, A Study in Scarlet, Wilma’s name was the first violinist's name to come to mind when he wanted to send Holmes to a violin recital during his investigation. Holmes - a talented violinist himself - came back from the concert and raved over her bow arm. Today, despite all of her other achievements, she is probably most famous for that singular fictional appearance! Watch out for part three of three, which discusses Wilma's later life and her influence on the next generation of women players. Bravo Emily! So well written and interesting! I see that you'll be doing a 3rd entry on Neruda, but this entry includes mention of Joachim & Brahms which would be the perfect seque into what you may want to consider as your next subject. When I read your first entry it was just days after I went to a Brahms chamber music marathon concert that included Rachel Barton Pine. She told the audience about her instrument , the del Gesu known as the ex-Soldat, and its connection to Brahms. Marie Soldat was a student of Joachim and Brahms was a mentor to her. Brahms was the one who selected this violin for her and it's not too much of a stretch of the imagination to think that the instrument was probably played in chamber music sessions that included Brahms & Joachim. Just a thought! Thanks so much for that! I would very much like to do a series of posts on these great women. I was thinking of doing them chronologically, which would mean Camilla Urso would come next. Right now I'm thinking (if I ever get that far), Wilma Norman-Neruda, Camilla Urso, Maud Powell, Marie Soldat, Leonora Jackson, Marie Hall, Teresina Tua, Kathleen Parlow, Erica Morini, and perhaps Ginette Neveu. And in a dream world I'd love to interview Ida Haendel, who in my eyes is the great surviving heir to this wonderful tradition of violin playing, and part of the first generation of players that I think could truly be taken seriously as not just women musicians, but musicians period. It would actually be a fascinating book but I'd need lots of money to travel to Europe first. So v.com members...send on your checks to Emily Liz and she'll write a book for you! Emily, I just want to say thanks for these blogs. They are so fascinating! I don't have anything to add except I wish these stories were more widely known, especially by young musicians and educators. I think it would have made a difference to me as a child and teen to have known about some woman violinists in addition to the men. It's much better nowadays, but it's also good to know that women violinists aren't just a recent phenomenon. Many thanks for this, Emily! I am glad for everyone who sheds a bit more light on women violinists! I did not realize myself before I started doing research on the violin in Japan, just how unusual it was for women to play the violin until well after the middle of the nineteenth century. The first time I saw a photograph of the student orchestra at the Tokyo Academy of Music around 1900, only the kimonos struck me as ‘exotic’ (you can see the picture in my article “Land of the Rising Sisters,” The Strad, May 2007: 60-64) -- until I realized that such a concentration of women in a university orchestra would have been rare indeed at the time. As late as the 1880s Joachim was advised to forbid women to even listen to (let alone take part in) the orchestra rehearsals at the conservatoire in Berlin. Joachim, by the way, is known for having taught quite a number of women. I have since done a bit of homework on the subject of women violinists (I have a longer article forthcoming sometime next year in the Women’s History Review, where I place the Kôda sisters in the context of women violinist in Europe), so the names Emily mentions in the first part of this article were familiar to me, but there quite a few more, I believe. A number of them are mentioned in an interesting article by Tully Potter in the recent May issue of the Strad. About the perception of the violin as male or female: Before the 19th century, it was widely perceived as male (‘le roi des instruments’), but examples of the violin being described as female multiply in the 19th century. The German scholar Freia Hoffmann, in her book “Instrument und Körper” (the instrument and the body – there is a Japanese translation!) even states that this identification might have been one of the reasons women violinists were frowned upon. The sight of them acting out a lesbian relationship on stage, as it were, was just too provocative. Meanwhile a man playing the violin was asserting his masculinity. However, many of the early 20th-c Japanese violin tutors I have examined still describe the violin as ‘the king’ of instruments, in one case even with the English word, suggesting an English-language source. So, presumably, both perceptions existed side by side. Funnily enough, when I surfed the net some time ago, I came across some German mailing list where a worried mother complained that her son was told by his friends that he must be gay, because he played the violin. Talk about changing times!